Author BILL CAUBLE has served as Chairman of the Board of the Ranching Heritage Center Museum and Foundation, is currently Chairman of the Board of the Fort Griffin Fandangle, Albany, Texas, and is a board member of the Old Jail Art Center and Museum in Albany. A caterer and ranching manager, he is renowned as a creative chuck wagon cook and is an artist as well.CLIFF TEINERT, who has cooked for three presidents and a queen and founded a catering business in the early 1970s, was the first to take the chuck wagon from a working ranch to parties, conferences, and other events where people enjoy meeting outdoors over traditional Southwestern food. 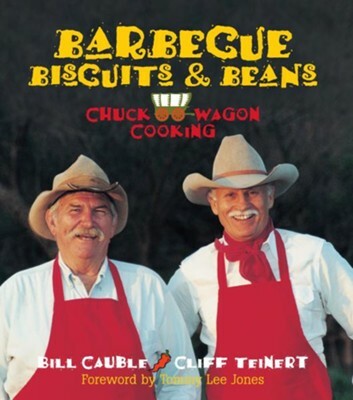 After originating, with the Abilene, Texas, Chamber of Commerce, the first Chuck Wagon Cook-off, he took the wagon-with two cords of mesquite wood-to Japan for a promotional tour for the Texas Beef Council and the USME Federation. I'm the author/artist and I want to review Barbecue, Biscuits & Beans - eBook.